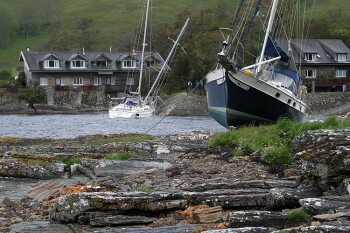 Earlier this year our beloved boat and home, Elsa, was torn from her mooring in a storm with winds gusting to 115 knots, and sickeningly ended up on rocks on Scotlands West coast. Miraculously she found a flattish patch to sit on and was not all that badly damaged, compared to many around her - tough as old boots. Never the less she was left high and dry by the storm surge. You learn alot from experiences like this. One thing was who to call when you have a 12 tonne boat stuck above the high water mark. We were looking for the answer while the power and phone networks were down, and trees were blocking the roads across Argyll. Fortunately fate threw us in the path of someone who knew, & the answer for this area is North West Marine. They were somewhat busy over the weeks that followed, recovering dozens of boats, but they managed the recovery of Elsa brilliantly. For those interested in seeing an ocean going yacht refloated, there is a video here of the final moments of her three week captivity. Tense, but such a relief http://www.youtube.com/watch?v=k4lQm13ik0s I've probably watched this a thousand times and always cheer when she comes off. This is an uncommon situation to find yourself in, but having done so we have learned the importance of having a good insurer. Our claims handler has seen us through from day one and has been brilliant. We got quotes for recovery and repair, they were checked by the insurers surveyor and then approved without quibble. The claims handler has co-ordinated payment of all bills and we have paid only our policy excess. It has been all that you hope insurance will be, but it seems not what it is commonly found, judging by the stories of owners of other boats afflicted during the storm. I can lend my personal recommendation to Bishop Skinner Marine, who, in addition to their excellent claims service, are committed to promoting the RNLI's lifesaving work. 2.5% of all premiums are donated to the cause, plus there's a premium discount for being an RNLI member. This all makes them a company hard to beat. An interesting aside is that although we lived aboard Elsa, the wider implications of an accident like this hadn't occurred to us. Of course we never thought it would happen so the prospect of finding and paying for alternative accommodation didnt enter our heads. Consequently we only asked whether were covered to liveaboard and enquired no further. With 20:20 hindsight I now think that somekind of 'liveaboard' cover would have been a really good idea, but it does not appear to be available. If anyone knows anything about insurance specifically for those whose only home is their boat I would be really interested to hear about it. Something I wish I'd have had when I lived on Inkwazi for five years. Bishop Skinner have created a liveaboard bolt on for �50 per annum which gives cover up to �5k for alternative accommodation. In addition to this their premiums are really reasonable with discounts for RNLI and RYA membership. If your boat is your home it's definitely worth a call.